an eggplant dip that uses capers and that we all love. It can be used as a spread on bread or as a dip (Peter). 2. Tip your capers out of the jar and discard salt water. Rinse then soak in lukewarm water for 20 minutes or so. 3. Cut eggplants into 3/4" cubes, place in a bowl, then toss in salt and pepper. Pour olive oil over cubes and toss. 4. Place eggplant on a baking sheet atop a baking pan and bake in oven for 15 to 20 minutes - or until golden and tender when forked. 5. Let eggplant cool then assemble other ingredients and reach into the back of the cupboard and fetch out that food processor. 6. Tip eggplant into the food processor and pulse briefly. 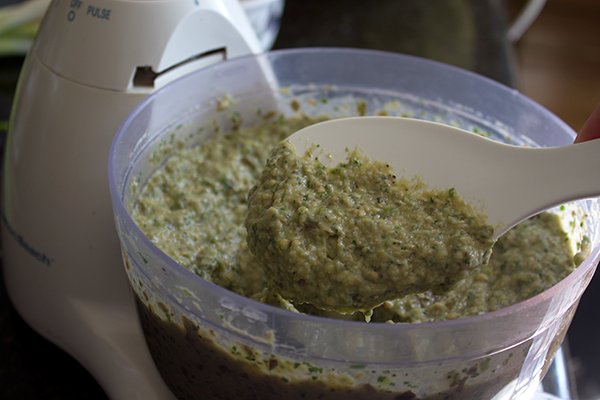 Then add capers, scallions, parsley, garlic, lemon zest, lemon juice, pomegranate molasses, yogurt, cayenne, and yogurt. Pulse until well combined. 7. Check for consistency and if necessary add more yogurt. Adjust seasoning. 8. Serve as a dip, on toast, or as a base for a nice sandwich. 5. Tip: Can be stored in the fridge for a week or so. It may dry out a bit so you may need to fold in a little more yogurt.